A 14-shot shut out for Phantoms' netminder Adam Long in Swindon. Coach Slava Koulikov saluted his crop of promising youngsters after Peterborough Phantoms snatched a pre-season challenge victory last night (September 9). 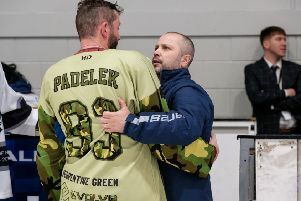 While veteran import Ales Padelek hit the winner in the final minute of a 4-3 success in Swindon, it was those at the other end of the age spectrum that earned the plaudits. Darius Pliskauskas is missing this weekend because of a minor injury. Koulikov used two netminders against the Wildcats with first-choice shot-stopper Adam Long not involved. Dan Lane, who will represent the club’s second team again this season, enjoyed a 14-shot shut-out before teenager Jack Peacock, who will be Long’s regular back-up, took over between the pipes a few seconds before the mid-point of the contest. Fellow youngsters Taylor Romeo and Jack Escott also impressed at the Link Centre – the former scooping Phantoms’ man-of-the-match gong in a game in which they saw a three-goal advantage wiped out before Padelek struck the decisive blow with 21 seconds left on the clock. “We tried a few different things and gave a few young guys plenty of ice-time,” said Koulikov. “It is important to do that where possible in these pre-season fixtures. “The two goalies in particular did very well and won us the game in all honesty. “Results don’t matter at this time of the year, but we showed excellent character to respond with a late goal after losing our lead. Phantoms were without import forward Darius Pliskauskas due to a minor injury. The Lithuanian international won’t feature in the return clash tonight (September 10) at Planet Ice either with the start of the National Ice Hockey League (NIHL) Division One South season looming large next weekend. Defenceman Robbie Ferrara was also left out last night, but there are no fitness worries where he is concerned. Will Weldon hit the only goal of the opening period before Phantoms extended their lead early in the middle session courtesy of captain James Ferrara and new signing Nathan Salem. But Toms Rutkis began Swindon’s fightback later in that stanza and a powerplay goal from Phil Hill cut their arrears further early in the final period. Chris Jones levelled with just under four-and-a-half minutes to go, but Padelek settled the contest in Phantoms’ favour.